The Gun/Knife Care Kit is exactly what you need to clean, polish and protect your knives, guns, and swords. The Gun/Knife Cleaner has an anti-smear degreasing formula safe for use on stainless steel and nickel as well as on the interior and exterior of the bore. The Gun and Knife wax features a water-based white carnauba and beeswax formula that contains no solvents, and provides exceptional results on gunblueing, polished or hand-rubbed stocks, stainless and nickel firearms. It removes and protects against rust, fingerprints, water stains, powder residue, blood, and more while remaining safe to the interior and exterior of the bore. It adds UV and acid rain protection, won't attract dust or wash off in rain, and protects up to six months. Flitz Metal Polish cleans stainless, nickel or HOT BLUED guns and knives, removing powder residue, fingerprints, rust, and more without harming the surface. 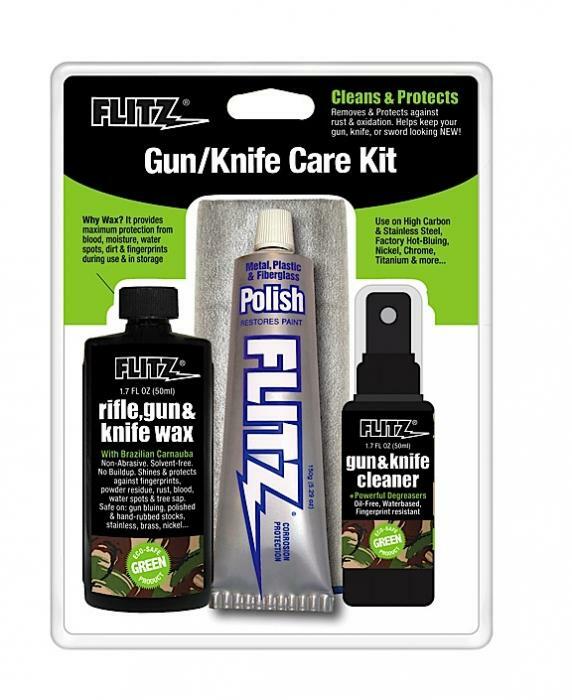 This kit contains: (1) Flitz Gun & Knife Cleaner 1.7oz, (1) Flitz Polish-Paste 1.7oz, (1) Flitz Rifle Gun & Knife Wax Protectant 1.7oz, and a 16"x16" Premium Microfiber Cloth.